Geothermal energy is thermal energy generated and stored in the Earth. Thermal energy is the energy that determines the temperature of matter. The geothermal energy of the Earth's crust originates from the original formation of the planet and from radioactive decay of materials (in currently uncertain but possibly roughly equal proportions). The geothermal gradient, which is the difference in temperature between the core of the planet and its surface, drives a continuous conduction of thermal energy in the form of heat from the core to the surface. The adjective geothermal originates from the Greek roots γη (ge), meaning earth, and θερμος (thermos), meaning hot. Earth's internal heat is thermal energy generated from radioactive decay and continual heat loss from Earth's formation. Temperatures at the core–mantle boundary may reach over 4000 °C (7,200 °F). The high temperature and pressure in Earth's interior cause some rock to melt and solid mantle to behave plastically, resulting in portions of the mantle convecting upward since it is lighter than the surrounding rock. Rock and water is heated in the crust, sometimes up to 370 °C (700 °F). With water from hot springs, geothermal energy has been used for bathing since Paleolithic times and for space heating since ancient Roman times, but it is now better known for electricity generation. Worldwide, 11,700 megawatts (MW) of geothermal power was available in 2013. An additional 28 gigawatts of direct geothermal heating capacity is installed for district heating, space heating, spas, industrial processes, desalination and agricultural applications as of 2010. Geothermal power is cost-effective, reliable, sustainable, and environmentally friendly, but has historically been limited to areas near tectonic plate boundaries. Recent technological advances have dramatically expanded the range and size of viable resources, especially for applications such as home heating, opening a potential for widespread exploitation. Geothermal wells release greenhouse gases trapped deep within the earth, but these emissions are much lower per energy unit than those of fossil fuels. The Earth's geothermal resources are theoretically more than adequate to supply humanity's energy needs, but only a very small fraction may be profitably exploited. Drilling and exploration for deep resources is very expensive. Forecasts for the future of geothermal power depend on assumptions about technology, energy prices, subsidies, plate boundary movement and interest rates. Pilot programs like EWEB's customer opt in Green Power Program show that customers would be willing to pay a little more for a renewable energy source like geothermal. But as a result of government assisted research and industry experience, the cost of generating geothermal power has decreased by 25% over the past two decades. In 2001, geothermal energy costs between two and ten US cents per kWh. Hot springs have been used for bathing at least since Paleolithic times. The oldest known spa is a stone pool on China's Lisan mountain built in the Qin Dynasty in the 3rd century BC, at the same site where the Huaqing Chi palace was later built. In the first century AD, Romans conquered Aquae Sulis, now Bath, Somerset, England, and used the hot springs there to feed public baths and underfloor heating. The admission fees for these baths probably represent the first commercial use of geothermal power. The world's oldest geothermal district heating system in Chaudes-Aigues, France, has been operating since the 14th century. 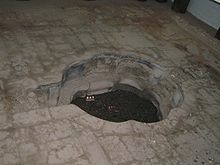 The earliest industrial exploitation began in 1827 with the use of geyser steam to extract boric acid from volcanic mud in Larderello, Italy. In 1892, America's first district heating system in Boise, Idaho was powered directly by geothermal energy, and was copied in Klamath Falls, Oregon in 1900. The first known building in the world to utilize geothermal energy as its primary heat source was the Hot Lake Hotel in Union County, Oregon, whose construction was completed in 1907. A deep geothermal well was used to heat greenhouses in Boise in 1926, and geysers were used to heat greenhouses in Iceland and Tuscany at about the same time. Charlie Lieb developed the first downhole heat exchanger in 1930 to heat his house. Steam and hot water from geysers began heating homes in Iceland starting in 1943. In the 20th century, demand for electricity led to the consideration of geothermal power as a generating source. Prince Piero Ginori Conti tested the first geothermal power generator on 4 July 1904, at the same Larderello dry steam field where geothermal acid extraction began. It successfully lit four light bulbs. Later, in 1911, the world's first commercial geothermal power plant was built there. It was the world's only industrial producer of geothermal electricity until New Zealand built a plant in 1958. In 2012, it produced some 594 megawatts. Lord Kelvin invented the heat pump in 1852, and Heinrich Zoelly had patented the idea of using it to draw heat from the ground in 1912. But it was not until the late 1940s that the geothermal heat pump was successfully implemented. The earliest one was probably Robert C. Webber's home-made 2.2 kW direct-exchange system, but sources disagree as to the exact timeline of his invention. J. Donald Kroeker designed the first commercial geothermal heat pump to heat the Commonwealth Building (Portland, Oregon) and demonstrated it in 1946. Professor Carl Nielsen of Ohio State University built the first residential open loop version in his home in 1948. The technology became popular in Sweden as a result of the 1973 oil crisis, and has been growing slowly in worldwide acceptance since then. The 1979 development of polybutylene pipe greatly augmented the heat pump's economic viability. In 1960, Pacific Gas and Electric began operation of the first successful geothermal electric power plant in the United States at The Geysers in California. The original turbine lasted for more than 30 years and produced 11 MW net power. The binary cycle power plant was first demonstrated in 1967 in the USSR and later introduced to the US in 1981. This technology allows the generation of electricity from much lower temperature resources than previously. In 2006, a binary cycle plant in Chena Hot Springs, Alaska, came on-line, producing electricity from a record low fluid temperature of 57 °C (135 °F). The International Geothermal Association (IGA) has reported that 10,715 megawatts (MW) of geothermal power in 24 countries is online, which was expected to generate 67,246 GWh of electricity in 2010. This represents a 20% increase in online capacity since 2005. IGA projects growth to 18,500 MW by 2015, due to the projects presently under consideration, often in areas previously assumed to have little exploitable resources. In 2010, the United States led the world in geothermal electricity production with 3,086 MW of installed capacity from 77 power plants. The largest group of geothermal power plants in the world is located at The Geysers, a geothermal field in California. The Philippines is the second highest producer, with 1,904 MW of capacity online. 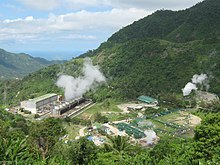 Geothermal power makes up approximately 27% of Philippine electricity generation. In 2016, Indonesia set in third with 1,647 MW online behind USA at 3,450 MW and the Philippines at 1,870 MW, but Indonesia will become second due to an additional online 130 MW at the end of 2016 and 255 MW in 2017. Indonesia's 28,994 MW are the largest geothermal reserves in the world, and it is predicted to overtake the US in the next decade. Geothermal electric plants were traditionally built exclusively on the edges of tectonic plates where high temperature geothermal resources are available near the surface. The development of binary cycle power plants and improvements in drilling and extraction technology enable enhanced geothermal systems over a much greater geographical range. Demonstration projects are operational in Landau-Pfalz, Germany, and Soultz-sous-Forêts, France, while an earlier effort in Basel, Switzerland was shut down after it triggered earthquakes. Other demonstration projects are under construction in Australia, the United Kingdom, and the United States of America. The thermal efficiency of geothermal electric plants is low, around 10–23%, because geothermal fluids do not reach the high temperatures of steam from boilers. The laws of thermodynamics limits the efficiency of heat engines in extracting useful energy. Exhaust heat is wasted, unless it can be used directly and locally, for example in greenhouses, timber mills, and district heating. System efficiency does not materially affect operational costs as it would for plants that use fuel, but it does affect return on the capital used to build the plant. In order to produce more energy than the pumps consume, electricity generation requires relatively hot fields and specialized heat cycles. Because geothermal power does not rely on variable sources of energy, unlike, for example, wind or solar, its capacity factor can be quite large – up to 96% has been demonstrated. The global average was 73% in 2005. Geothermal energy comes in either vapor-dominated or liquid-dominated forms. Larderello and The Geysers are vapor-dominated. Vapor-dominated sites offer temperatures from 240 to 300 °C that produce superheated steam. Liquid-dominated reservoirs (LDRs) were more common with temperatures greater than 200 °C (392 °F) and are found near young volcanoes surrounding the Pacific Ocean and in rift zones and hot spots. Flash plants are the common way to generate electricity from these sources. Pumps are generally not required, powered instead when the water turns to steam. Most wells generate 2-10 MWe. Steam is separated from liquid via cyclone separators, while the liquid is returned to the reservoir for reheating/reuse. As of 2013, the largest liquid system is Cerro Prieto in Mexico, which generates 750 MWe from temperatures reaching 350 °C (662 °F). The Salton Sea field in Southern California offers the potential of generating 2000 MWe. Lower temperature LDRs (120–200 °C) require pumping. They are common in extensional terrains, where heating takes place via deep circulation along faults, such as in the Western US and Turkey. Water passes through a heat exchanger in a Rankine cycle binary plant. The water vaporizes an organic working fluid that drives a turbine. These binary plants originated in the Soviet Union in the late 1960s and predominate in new US plants. Binary plants have no emissions. Lower temperature sources produce the energy equivalent of 100M BBL per year. Sources with temperatures of 30–150 °C are used without conversion to electricity as district heating, greenhouses, fisheries, mineral recovery, industrial process heating and bathing in 75 countries. Heat pumps extract energy from shallow sources at 10–20 °C in 43 countries for use in space heating and cooling. Home heating is the fastest-growing means of exploiting geothermal energy, with global annual growth rate of 30% in 2005 and 20% in 2012. Approximately 270 petajoules (PJ) of geothermal heating was used in 2004. More than half went for space heating, and another third for heated pools. The remainder supported industrial and agricultural applications. Global installed capacity was 28 GW, but capacity factors tend to be low (30% on average) since heat is mostly needed in winter. Some 88 PJ for space heating was extracted by an estimated 1.3 million geothermal heat pumps with a total capacity of 15 GW. Heat for these purposes may also be extracted from co-generation at a geothermal electrical plant. Heating is cost-effective at many more sites than electricity generation. At natural hot springs or geysers, water can be piped directly into radiators. In hot, dry ground, earth tubes or downhole heat exchangers can collect the heat. However, even in areas where the ground is colder than room temperature, heat can often be extracted with a geothermal heat pump more cost-effectively and cleanly than by conventional furnaces. These devices draw on much shallower and colder resources than traditional geothermal techniques. They frequently combine functions, including air conditioning, seasonal thermal energy storage, solar energy collection, and electric heating. Heat pumps can be used for space heating essentially anywhere. Iceland is the world leader in direct applications. Some 92.5% of its homes are heated with geothermal energy, saving Iceland over $100 million annually in avoided oil imports. Reykjavík, Iceland has the world's biggest district heating system, often used to heat pathways and roads to hinder the accumulation of ice. Once known as the most polluted city in the world, it is now one of the cleanest. Enhanced geothermal systems (EGS) actively inject water into wells to be heated and pumped back out. The water is injected under high pressure to expand existing rock fissures to enable the water to freely flow in and out. The technique was adapted from oil and gas extraction techniques. However, the geologic formations are deeper and no toxic chemicals are used, reducing the possibility of environmental damage. Drillers can employ directional drilling to expand the size of the reservoir. Small-scale EGS have been installed in the Rhine Graben at Soultz-sous-Forêts in France and at Landau and Insheim in Germany. Geothermal power requires no fuel (except for pumps), and is therefore immune to fuel cost fluctuations. However, capital costs are significant. Drilling accounts for over half the costs, and exploration of deep resources entails significant risks. A typical well doublet (extraction and injection wells) in Nevada can support 4.5 megawatts (MW) and costs about $10 million to drill, with a 20% failure rate. In total, electrical plant construction and well drilling cost about €2–5 million per MW of electrical capacity, while the break–even price is 0.04–0.10 € per kW·h. Enhanced geothermal systems tend to be on the high side of these ranges, with capital costs above $4 million per MW and break–even above $0.054 per kW·h in 2007. Direct heating applications can use much shallower wells with lower temperatures, so smaller systems with lower costs and risks are feasible. Residential geothermal heat pumps with a capacity of 10 kilowatt (kW) are routinely installed for around $1–3,000 per kilowatt. District heating systems may benefit from economies of scale if demand is geographically dense, as in cities and greenhouses, but otherwise piping installation dominates capital costs. The capital cost of one such district heating system in Bavaria was estimated at somewhat over 1 million € per MW. Direct systems of any size are much simpler than electric generators and have lower maintenance costs per kW·h, but they must consume electricity to run pumps and compressors. Some governments subsidize geothermal projects. Geothermal power is highly scalable: from a rural village to an entire city. The most developed geothermal field in the United States is The Geysers in Northern California. Geothermal projects have several stages of development. Each phase has associated risks. At the early stages of reconnaissance and geophysical surveys, many projects are cancelled, making that phase unsuitable for traditional lending. Projects moving forward from the identification, exploration and exploratory drilling often trade equity for financing. The Earth's internal thermal energy flows to the surface by conduction at a rate of 44.2 terawatts (TW), and is replenished by radioactive decay of minerals at a rate of 30 TW. These power rates are more than double humanity's current energy consumption from all primary sources, but most of this energy flow is not recoverable. In addition to the internal heat flows, the top layer of the surface to a depth of 10 meters (33 ft) is heated by solar energy during the summer, and releases that energy and cools during the winter. Outside of the seasonal variations, the geothermal gradient of temperatures through the crust is 25–30 °C (77–86 °F) per kilometer of depth in most of the world. The conductive heat flux averages 0.1 MW/km2. These values are much higher near tectonic plate boundaries where the crust is thinner. They may be further augmented by fluid circulation, either through magma conduits, hot springs, hydrothermal circulation or a combination of these. A geothermal heat pump can extract enough heat from shallow ground anywhere in the world to provide home heating, but industrial applications need the higher temperatures of deep resources. The thermal efficiency and profitability of electricity generation is particularly sensitive to temperature. The most demanding applications receive the greatest benefit from a high natural heat flux, ideally from using a hot spring. The next best option is to drill a well into a hot aquifer. If no adequate aquifer is available, an artificial one may be built by injecting water to hydraulically fracture the bedrock. This last approach is called hot dry rock geothermal energy in Europe, or enhanced geothermal systems in North America. Much greater potential may be available from this approach than from conventional tapping of natural aquifers. Estimates of the potential for electricity generation from geothermal energy vary sixfold, from .035to2TW depending on the scale of investments. Upper estimates of geothermal resources assume enhanced geothermal wells as deep as 10 kilometres (6 mi), whereas existing geothermal wells are rarely more than 3 kilometres (2 mi) deep. Wells of this depth are now common in the petroleum industry. The deepest research well in the world, the Kola superdeep borehole, is 12 kilometres (7 mi) deep. Myanmar Engineering Society has identified at least 39 locations (in Myanmar) capable of geothermal power production and some of these hydrothermal reservoirs lie quite close to Yangon which is a significant underutilized resource. According to the Geothermal Energy Association (GEA) installed geothermal capacity in the United States grew by 5%, or 147.05 MW, since the last annual survey in March 2012. This increase came from seven geothermal projects that began production in 2012. GEA also revised its 2011 estimate of installed capacity upward by 128 MW, bringing current installed U.S. geothermal capacity to 3,386 MW. Geothermal power is also considered to be sustainable thanks to its power to sustain the Earth's intricate ecosystems. By using geothermal sources of energy present generations of humans will not endanger the capability of future generations to use their own resources to the same amount that those energy sources are presently used. Further, due to its low emissions geothermal energy is considered to have excellent potential for mitigation of global warming. Even though geothermal power is globally sustainable, extraction must still be monitored to avoid local depletion. Over the course of decades, individual wells draw down local temperatures and water levels until a new equilibrium is reached with natural flows. The three oldest sites, at Larderello, Wairakei, and the Geysers have experienced reduced output because of local depletion. Heat and water, in uncertain proportions, were extracted faster than they were replenished. If production is reduced and water is reinjected, these wells could theoretically recover their full potential. Such mitigation strategies have already been implemented at some sites. The long-term sustainability of geothermal energy has been demonstrated at the Lardarello field in Italy since 1913, at the Wairakei field in New Zealand since 1958, and at The Geysers field in California since 1960. Falling electricity production may be boosted through drilling additional supply boreholes, as at Poihipi and Ohaaki. The Wairakei power station has been running much longer, with its first unit commissioned in November 1958, and it attained its peak generation of 173MW in 1965, but already the supply of high-pressure steam was faltering, in 1982 being derated to intermediate pressure and the station managing 157MW. Around the start of the 21st century it was managing about 150MW, then in 2005 two 8MW isopentane systems were added, boosting the station's output by about 14MW. Detailed data are unavailable, being lost due to re-organisations. One such re-organisation in 1996 causes the absence of early data for Poihipi (started 1996), and the gap in 1996/7 for Wairakei and Ohaaki; half-hourly data for Ohaaki's first few months of operation are also missing, as well as for most of Wairakei's history. 2 per megawatt-hour (MW·h) of electricity, a small fraction of the emission intensity of conventional fossil fuel plants. Plants that experience high levels of acids and volatile chemicals are usually equipped with emission-control systems to reduce the exhaust. In addition to dissolved gases, hot water from geothermal sources may hold in solution trace amounts of toxic elements such as mercury, arsenic, boron, and antimony. These chemicals precipitate as the water cools, and can cause environmental damage if released. The modern practice of injecting cooled geothermal fluids back into the Earth to stimulate production has the side benefit of reducing this environmental risk. Direct geothermal heating systems contain pumps and compressors, which may consume energy from a polluting source. This parasitic load is normally a fraction of the heat output, so it is always less polluting than electric heating. However, if the electricity is produced by burning fossil fuels, then the net emissions of geothermal heating may be comparable to directly burning the fuel for heat. For example, a geothermal heat pump powered by electricity from a combined cycle natural gas plant would produce about as much pollution as a natural gas condensing furnace of the same size. Therefore, the environmental value of direct geothermal heating applications is highly dependent on the emissions intensity of the neighboring electric grid. Plant construction can adversely affect land stability. Subsidence has occurred in the Wairakei field in New Zealand. In Staufen im Breisgau, Germany, tectonic uplift occurred instead, due to a previously isolated anhydrite layer coming in contact with water and turning into gypsum, doubling its volume.Enhanced geothermal systems can trigger earthquakes as part of hydraulic fracturing. The project in Basel, Switzerland was suspended because more than 10,000 seismic events measuring up to 3.4 on the Richter Scale occurred over the first 6 days of water injection. Geothermal has minimal land and freshwater requirements. Geothermal plants use 3.5 square kilometres (1.4 sq mi) per gigawatt of electrical production (not capacity) versus 32 square kilometres (12 sq mi) and 12 square kilometres (4.6 sq mi) for coal facilities and wind farms respectively. They use 20 litres (5.3 US gal) of freshwater per MW·h versus over 1,000 litres (260 US gal) per MW·h for nuclear, coal, or oil. Some of the legal issues raised by geothermal energy resources include questions of ownership and allocation of the resource, the grant of exploration permits, exploitation rights, royalties, and the extent to which geothermal energy issues have been recognized in existing planning and environmental laws. Other questions concern overlap between geothermal and mineral or petroleum tenements. Broader issues concern the extent to which the legal framework for encouragement of renewable energy assists in encouraging geothermal industry innovation and development. ^ Dye, S. T. (2012). "Geoneutrinos and the radioactive power of the Earth". Reviews of Geophysics. 50 (3): RG3007. arXiv:1111.6099. Bibcode:2012RvGeo..50.3007D. doi:10.1029/2012RG000400. ^ Gando, A.; Dwyer, D. A.; McKeown, R. D.; Zhang, C. (2011). "Partial radiogenic heat model for Earth revealed by geoneutrino measurements". Nature Geoscience. 4 (9): 647. Bibcode:2011NatGe...4..647K. doi:10.1038/ngeo1205. ^ Cleveland & Morris 2015, p. 291. ^ "Indonesia Set to Become World's 2nd Largest Geothermal Power Producer". Retrieved November 27, 2016. ^ a b Low-Temperature and Co-produced Geothermal Resources. U.S. Department of Energy. ^ "Reykjavik: The ground heats the city - Danish Architecture Centre". Archived from the original on 2016-08-25. ^ Geothermal Energy Association. "Major Companies". Geothermal Energy Association. Archived from the original on 22 April 2014. Retrieved 24 April 2014. ^ Deloitte, Department of Energy (February 15, 2008). "Geothermal Risk Mitigation Strategies Report". Office of Energy Efficiency and Renewable Energy Geothermal Program. ^ Pollack, H.N. ; S. J. Hurter; J. R. Johnson (1993). "Heat Flow from the Earth's Interior: Analysis of the Global Data Set". Rev. Geophys. 30 (3): 267–280. Bibcode:1993RvGeo..31..267P. doi:10.1029/93RG01249. ^ a b Rybach, Ladislaus (September 2007). Geothermal Sustainability (PDF). Geo-Heat Centre Quarterly Bulletin. 28. Klamath Falls, Oregon: Oregon Institute of Technology. pp. 2–7. Retrieved 2009-05-09. ^ Staufen: Risse: Hoffnung in Staufen: Quellvorgänge lassen nach. badische-zeitung.de. Retrieved on 2013-04-24. ^ DLR Portal – TerraSAR-X image of the month: Ground uplift under Staufen's Old Town. Dlr.de (2009-10-21). Retrieved on 2013-04-24. ^ WECHSELWIRKUNG – Numerische Geotechnik. Wechselwirkung.eu. Retrieved on 2013-04-24. Cutler J. Cleveland; Christopher G. Morris (2015). Dictionary of Energy (2 ed.). Elsevier. ISBN 978-0-08-096811-7. 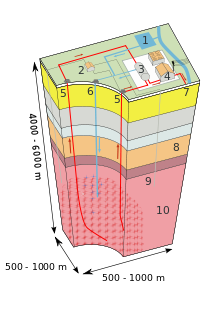 Look up geothermal in Wiktionary, the free dictionary. 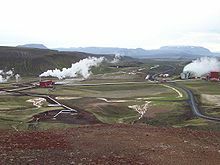 Wikimedia Commons has media related to Geothermal energy.